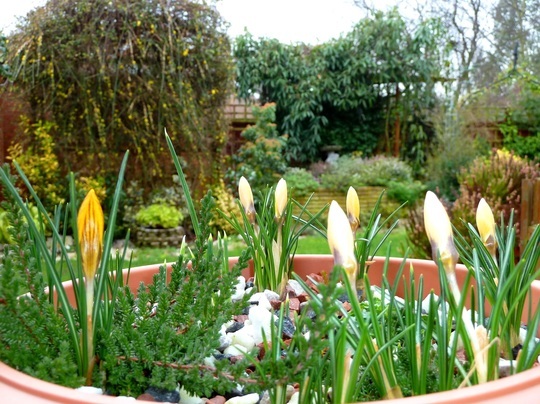 Cute little crocus in a pot .. In my back garden today. Lots of colour there , Terra . Very pretty . Lovely to see TT :o)) , yours are much further ahead than ours ! your garden is so much further on than mine. these are lovely. I just have a bit of foliage up above ground. As others have said these Crocuses make you feel happy! I wouldn't be without them on my balcony! I have been growing them every year I think since we've lived here - now 12 years! Lovely crocus signs of spring and your super garden as a backdrop what a cheerer upper TT :o) There is a 2" snow blanket here hiding my snowdrops and maybe even a crocus or two!! Btw, my cream crocus are also showing their colour like this, but somehow yours look prettier! Well I love your pretty Crocus....mine are still hidden. We are expecting our first snow tomorrow....my poor plants will remain hidden I think. Sorry to hear you are unwell Karen. Keep warm and soon we will be able to enjoy the spring weather. Milder weather in England by Thursday. Lovely Crocus TT. I was leaving an antique fair at a sports centre at Brentwood, over a week ago, I was amazed to see hundreds of daffodils in full bloom, sheltered by a hedge, and lining the verge. They lifted my spirits. Compliments to Brentwood council parks department. What a lovely sight Terra. We're all willing spring to come fast now. Go away snow!......brrrrr! milder weather and spring flowers on their way !!! Snowing hard here Terra! :( but it won't lie....tomorrow is promising to be much warmer! justifies spending cash on a new bikini !!! Is that winter jasmine in the background? nice to have lots of evergreens ! Yes, Pam and Bornagain .. I haven't done any gardening all winter, other than raking up leaves off the lawns and paths ! Hi Sandra .. many thanks.. This looks lovely Tt. So cheerful. It's snowing like billyo here at my daughters and T says its the same at home. Fingers crossed it stops soon and then thaws quickly. I only had 2 crocus flowers out before I came up here and the birds pulled them off!!!!! Added to favourites - a very lovely sight. beauties! Nothing to report as yet this end (in Bury) but lots of little pokey-out bits of green! Wonder what they will be. eeeeeeeeeeeeeeeeeeeeeeeeeeeeek exxxcccccciiiittttiiinnnnng!